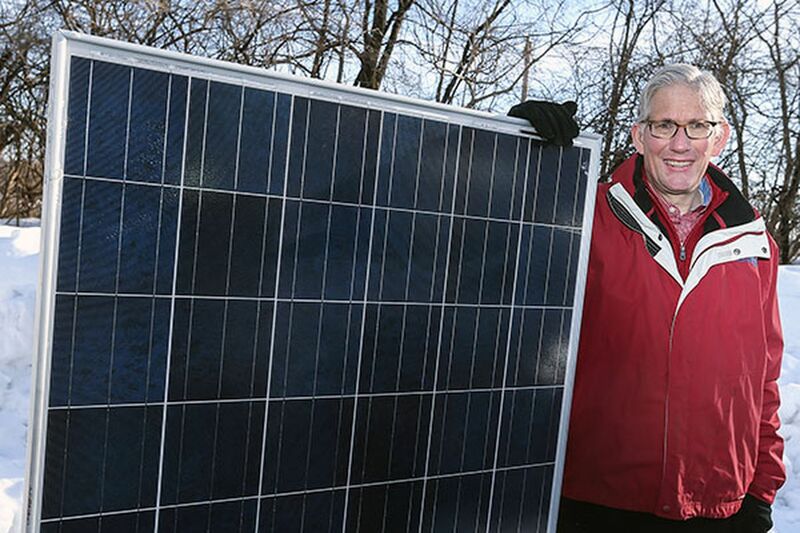 JAMES E. INNES II, 58, of Glenside, is CEO of CarrierClass Green Infrastructure, a Plymouth Meeting firm that designs, sells and installs off-grid, outdoor solar-charging stations, primarily for commercial customers. The firm has built Cafe ConnecTable for outdoor solar mobile-device charging. Q: How'd you come up with the idea for ConnecTables? A: The firm was founded in 2009 to develop commercial and institutional solar PV [photovoltaic] products. We raised some money from Ian Jones, who's my partner. We built a 30-kilowatt solar system for our landlord, but in hindsight we were on a "solarcoaster." Unless you're a big [player] with lots of money in good niches in states with good incentives . . . business is very cyclical. We had to rethink it. A: We bought a broken solar panel. I thought it would make a nice tabletop. Then I figured: Take the table and attach it to a solar panel with a battery pack, and you can recharge the batteries in a day. That was in 2013 and led to Cafe ConnecTable. A full battery will support 75 to 150 handheld-mobile-device charges daily, even after a few days of poor weather. A: An early market for these tables is universities where green awareness is part of their institutional values. The second selling point is convenience charging. On some campuses they actually have "outlet wars." In nasty weather, [students] cluster around electric outlets near classrooms, and it drives facilities managers nuts. Q: How much does a Cafe ConnecTable cost? A: List price is $12,500. Q: That doesn't sound like something a typical homeowner with an outage can afford. A: If you were thinking about buying these to power a home after an outage, the economics would be lousy. A: In the next month, we'll announce a large university in California and another in Maryland. Towson University is evaluating a prototype. We're also negotiating a lease arrangement for tables with a large real-estate investment trust. We expect to sell 24 tables by the end of March. Q: You have competitors. What differentiates you? A: Our table is an architect-designed, fully engineered, robust solar-charging station that people can use to charge devices within almost any outdoor setting. It has 500 watts of solar-power capacity and utilizes all American-made components. A: We have six full time plus a four-person product-development team who are third-party professionals we partner with.